You are nearly a month old. Where does the time go? It feels like only a few days ago I was longing to meet you and to hold you in my arms. Now that you are here, I cannot imagine life without you. 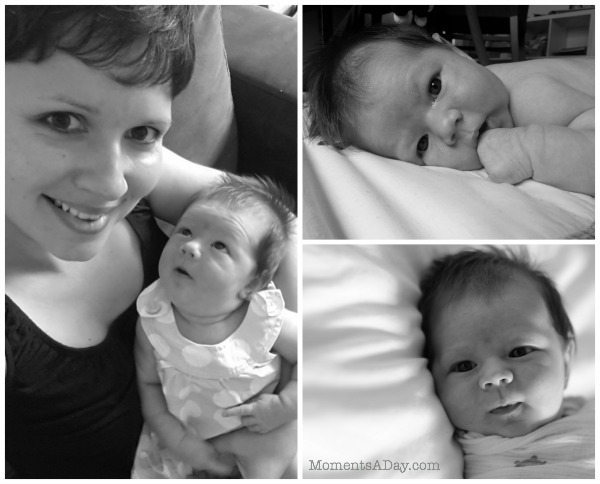 Over the past few weeks I have experienced a range of emotions about now having a daughter. Mostly excitement and gratitude, but I have also felt some fear and confusion. Why must there be so much attention on your physical appearance? Why should people care so much about what you wear – even as an infant? Why do stores stock shoes and clothes for babies that are not comfortable – such as scratchy tutus or fancy shoes – which are mostly being marketed only to girls? I just can’t remember the fuss over what your brothers looked like, or what they wore. Where will starting on a path focusing on your body (instead of nurturing your whole being) lead you? What can I do – as your mother – to exemplify the values of self-confidence and moderation that I want you to develop? How can I show you that you are MORE than what you look like? That being fashionable won’t make you happy? And that being “beautiful” is not the greatest achievement in life? because these thoughts can distract us from our reality. They take up our time and sap our mental energy, which can be spent doing other things. Like offering acts of kindness. Or creating something that makes people happy. If I do not have my priorities set this way, what example will I be setting for you? There is nothing wrong with being beautiful on the outside. You ARE beautiful. But this piece of information about your identity is only a small part of your total being. You are a beautiful soul with talents, opportunities, and gifts that are absolutely and undeniably unique. There is only one you – one mind like yours and one heart like yours – and you have one shot at this life to make the most of it. I hope you will always remember that, and live to honour your true reality. You are now my inspiration to honour mine. To read more in this series of letters, visit the Dear Daughter Archives. Chelsea this is absolutely beautiful. AND ever so true. It’s unfortunate that the ‘cool’ fashions of society have even made their way to our very smallest and have made them into a kind of fashion accessory of mothers. Wow! What a powerful point you make. I really admire your clarity. I myself have three daughters and I wasn’t too be more aware of these messages as well. Thank you so much! And on the topic of fashion accessory, I agree! What an upside down situation when people, unwittingly, have their children serve them, so to speak, when the parents are supposed to be serving their children’s well-being! Thank you for opening more eyes to the way parenting is supposed to be! What a strong message to our daughters. So many girls grow up with low self esteem which leads them to poor choices and a cycle of heartbreak. If we can empower our young daughters with the message of their inner beauty and strength of conviction we are giving them tools to help them to grow to be strong self assured women.